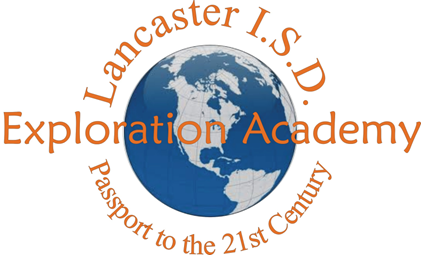 Identified GT students in grades 2-5 have the opportunity to attend Lancaster ISD's Exploration Academy. Exploration Academy is a pullout program designed to provide an environment that encourages thinking, develops confidence and self expression and provide leadership opportunities. All Kindergarteners are screened for GT services in the Spring semester. If they qualify for services, they will begin receiving services in the Fall of their 1st grade year on their home campus. Students who are identified as GT in the 6th grade have an opportunity to receive GT services through their elective classes. Students will continue building on the skills that they learned in elementary GT services and continue to develop in the area of leadership and critical thinking skills. On the high school level, identified GT students are enrolled in Pre-AP and AP courses, according to their talent area.. Outlines for these courses are prepared by the College Board. This organization also designs and manages the assessment program for the courses. Students who earn a score of 3 or greater on the College Board AP Exams earn credit in many colleges and universities throughout the nation. Students in the GT Department have opportunities to take field trips during the school year. There is an end of the year GT Showcase where students get to share their work with the community. 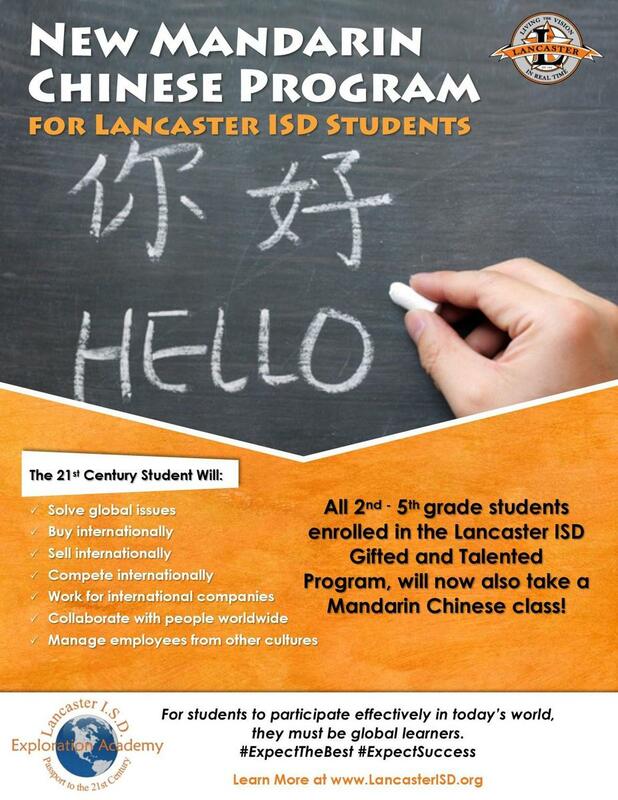 All 2nd-5th grade students enrolled in Lancaster ISD Gifted and Talented Program, will now also take Mandarin Chinese class. This will allow students to be more competitive internationally, have opportunities to work for international companies and collaborate with people worldwide. Contact a Pleasant Run Global Arts Academy GT Specialist @ 972-218-1538. You may also click on the flyer below for more information as well.